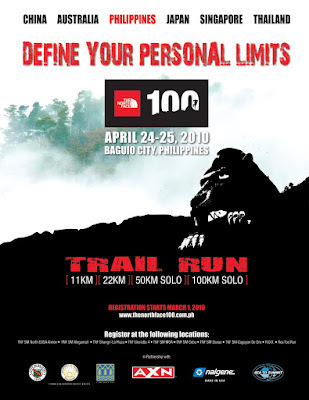 The North Face 100 in Baguio-Benguet, Philippines to be held on April 24-25, 2010 is, so far, the most challenging race organized this year. In its third year, the North Face 100 is a real test of endurance for elite athletes and aspiring individuals. The North Face 100, also known as tnf 100, is not your ordinary running race. It is a trail running race that traverses trails of Camp John Hay, the Philippine Military Academy (PMA) grounds, Mt. Sto.Tomas and Tuba and finishing in Burnham Park. This race, Asia's 1st Trail Running Ultra Marathon series, that will be held in the coolest place in the Philippines has four categories: 11k, 22k, 50k and 100k trail run. Registration fees are P500 for 11k and 22k, and P2,000 for the 50k and 100k. Registration kits contain the race jersey, bib, maps, and Side Trip Travel Magazine but special TNF 100 tokens await 50k and 100k runners who finish in their categories. So what are you waiting for? Define your personal limits 6,000++ ft above sea level! Join The North Face 100 in Baguio-Benguet. Visit: www.thenorthface100.ph. This is guaranteed to be the most thrilling and challenging race that will test your mind, body and heart.